K-9 Officer Rex, 8 years old, reported for his heavenly duty on Monday, March 25, 2019 with his faithful partner, Robert Pemberton and family by his side. A final bow will be held 6 P.M., Tuesday, April 2, 2019 at Coker-Mathews Funeral Home Chapel with Rev. Jimmy Vaughn, Chief Scott Smith and Judge Keli Aiken speaking. 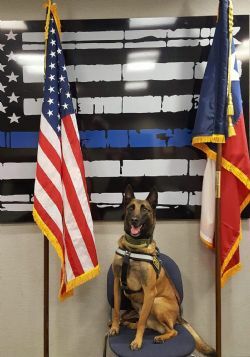 Rex, who was born in June of 2010 in The Netherlands, served faithfully and loyally as the Greenville Police Department’s K-9 Officer since December 2012, and had a distinguished career with the department. In 2016, Officer Pemberton and K-9 Rex were recognized by The Black Asphalt Law Enforcement Network for seizing 32.7 Kilos of Crystal Meth, this was the largest Crystal Meth seizure reported to The Black Asphalt in 2016. In 2017, Rex was named Top Narcotics Dog from the United States Police Canine Association (U.S.P.C.A.) Region 20 and the Most Weapons Seized as a Result of a Traffic Stop by the National Interdiction Conference in Pennsylvania. That same year, the Texas Narcotics Officers Association awarded Pemberton and Rex with State K-9 Team of the Year. U.S. Rep. John Ratcliffe (R-Fate) also presented a commendation to the team after he learned Pemberton and K-9 Rex had been named as the Greenville Kiwanis Police Officer and K-9 of the Year in 2017. Rex is survived by his partner and dad, Officer Robert Pemberton; his human family, mom, Diana Pemberton; siblings, Holten, Hunter and Hannah Pemberton; his fellow Officers of the Greenville Police Department and all the Greenville and surrounding Communities. Rex is preceded in death by his brother, K-9 Officer Ceiko. Pawbearers will be his fellow K-9 Officer brothers and sisters in Blue. In honor of Rex, you may bring dog toys to his Final Bow that will be donated to the Greenville Animal Shelter in memory of Rex. No words can express the appreciation for your efforts you have made to help fight the war on drugs and terrorism. Thank you Rex for your protection and service to our community.